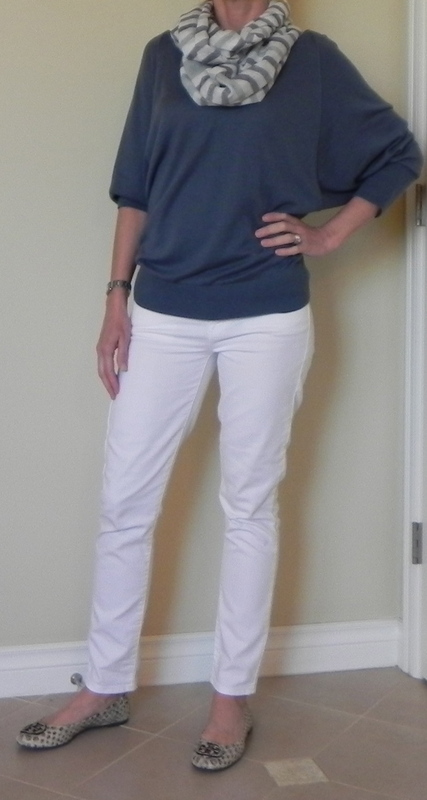 As such, I’ve decided to wear this gorgeous blue dolman sleeve sweater paired with my cropped white toothpick pants from J Crew. To keep this from being too plain, and to tie the pants and sweater together, I added a blue and white scarf*. On the right I originally tried the sweater with cropped jeans- and while I have said to dress in all one color (to look taller and slimmer)- in this case, it doesn’t work. Part of the problem is simply the way I’m wearing the sweater. Notice the long sleeves and how the waistband is pulled way down. The black shoes aren’t helping either. On the left the white pants are more ‘springy’ and the snakeskin flats are also a much lighter look. Pushing the sleeves up also helps! Even though it's Spring- I still need a sweater, it's chilly out there! *If you read yesterday’s post about scarfs- this one is tied in a knot to create a faux infinity scarf. ** I stand corrected- Mother Nature surprised me this morning and the sun is actually out. Thank you!! (I wrote this post late last night after a grey day of rain). I want to update my wardrobe for spring, can you give me your thoughts on must have pieces to add? Thanks Megan, keep up the great work! A few key pieces for spring are definitely something that is bright- colors are so popular right now. I would recommend a bright grandpa style cardigan and possibly some bright jeans (although not worn together). A maxi dress is another must have. Old Navy has some cute, inexpensive ones. I just loaded up on bright tanks at the Gap and they were on the sale rack- at $5 each- can’t do better than that! So cute! Those snakeskin flats would go with anything. Are they still available to buy? I need some croppy skinny pants. I am tall though and I things end up either being very long or if they are meant to be cropped they end up looking too capri length. I need to make that my mission to find some good just above ankle length pants…. Great point, in the picture on the right my legs look a lot shorter than on the left. The cropping is in the wrong place- an ankle crop is more flattering! For you long (or short) legged gals- the tailor should be your best friend. Don’t be afraid to have pants altered- it’s not that expensive (around $20) and can totally change the look altogether. I love J Crew toothpick jeans – I have them in 3 colors, red, white and blue 🙂 I really want green still! Love the crispness of the white and blue!